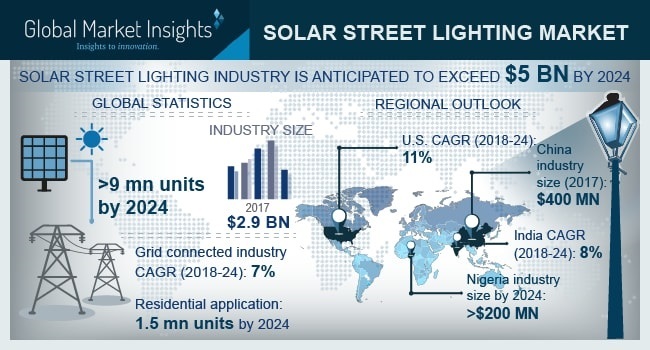 Solar Street Lighting Market size will exceed USD 5 Billion by 2024, as reported in the latest study by Global Market Insights, Inc. Global efforts to curtail the emission of greenhouse gases across key economic sectors will positively influence the solar street lighting market. Initiatives toward achieving sustainable development with minimal ecological impact will further propel the product demand. In April 2016, Paris Climate Accord was signed under the United Nations Framework Convention on Climate Change (UNFCCC) in response to the rising global temperatures. As of 2018, 195 countries have signed the agreement and announced voluntary emission reduction targets. Energy efficiency, low emission rate, longer service life and ecological operations are some of the paramount factors which will boost the demand for Light Emitting Diode (LED) based solar street lights. Declining product prices along with efforts to mitigate harmful effects of Mercury released from CFLs will further enhance the business landscape. Standalone solar street lighting market is set to witness strong growth subject to rising product adoption across off-grid areas. Emerging economies across Africa and Asia-Pacific offer substantial opportunity for product installation on account of respective government plans to increase the utilization of renewable energy resources. High cost associated with green field investment to electrify off grid and remote areas will further provide impetus to the business growth. India market is set to witness gains over 8% by 2024. Government initiatives to promote non-conventional energy utilization along with investments toward improvement in street lighting infrastructure will drive the business growth across the country. As per the International Energy Agency (IEA) in 2016, around 200 million people in India lacked electricity access. Solar street lights offer a sustainable solution to meet the rising electricity demand and support government plans to integrate renewable energy resources. Major solar street lighting industry participants include Bisol, Anhui Longvolt, Solar Lighting International, Greenshine, Orion, Solar G, Leadsun, Covimed, SEPCO, Jinhua SunMaster, Zhuhai Bomin, Shenzhen Spark Optoelectronics, Urja, Solux, Solar Street Lights USA, Sol, Su-Kam, Exide, Philips, Sunna, Dragons Breath, SOKOYO, Omega, and Bridgelux.